Sometimes things don't work out as planned. I was planning to add extra features to retouch scanned pictures, but there is no significant demand for it. I received only a handful of requests for such features. There are lots of software to do these tricks anyway. The plan has been scrapped. But there is no software that would open multiple scanned images each containing multiple photos and detect them all in one go. People requested this feature with an increasing frequency over the years. Now it's almost finished, you can open many files at once, go fetch a coffee until processing finishes, then you just comfortably review the results in thumbnails. 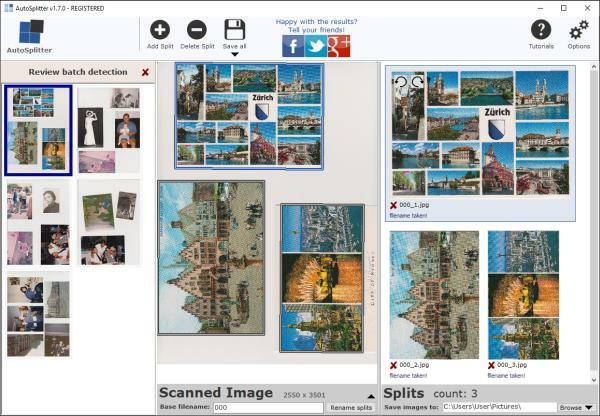 Should you see any false detections or inaccuracies, you can quickly open the image and adjust the splits as necessary.